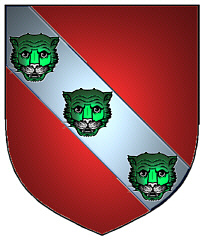 Red shield on a silver bend three green leopards faces. Spelling variations include: Stevenson, Stephenson, Stephinson, Stevenston, Steenson, Stenson, Steinson and many more. First found in Northumberland where they were seated from very ancient times, some say before the Norman Conquest in 1066. 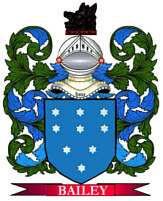 Some of the first settlers of this name or some of its variants were: Joseph Stephenson who settled in Argentia, in Newfoundland, in 1730; William and Mathew Stevenson settled in Harbour Grace, Newfoundland, in 1760; Andrew Stevenson settled at Charlestown Mass. in 1630.